Added by Bill Bowman on September 18, 2018. The chairman of the Somerset County Republican Party has called on Deputy Mayor Shanel Robinson to release all of her emails with Township Councilman Rajiv Prasad concerning the “Peace and Nonviolence” monument park project. Updated with comment from Deputy Mayor Robinson and statement from the Somerset County Democratic Committee. The chairman of the Somerset County Republican party Sept. 18 called on Deputy Mayor Shanel Robinson to release all of her emails concerning the “Peace and Nonviolence” monument park issue. The demand comes in the wake of a contentious Sept. 13 Township Council meeting, in which some residents and one councilman called for Prasad to resign in light of a Franklin Reporter & Advocate stories detailing his handling of the monument park’s approval process. The stories run by the FR&A showed that the four statues targeted for the park – planned to be located at the corner of Route 27 and Cortelyous Road, on township-owned open space – were ordered and constructed well before the council approved the plan. The statues and the materials for the monument are being donated by a private individual. Money for the site’s construction has also been donated. The stories also showed that Prasad notified supporters of the project that action on it would be taken at the council’s Aug. 14 meeting, and encouraged them to attend and speak up for it, even though the site, was kept off that meeting’s agenda. 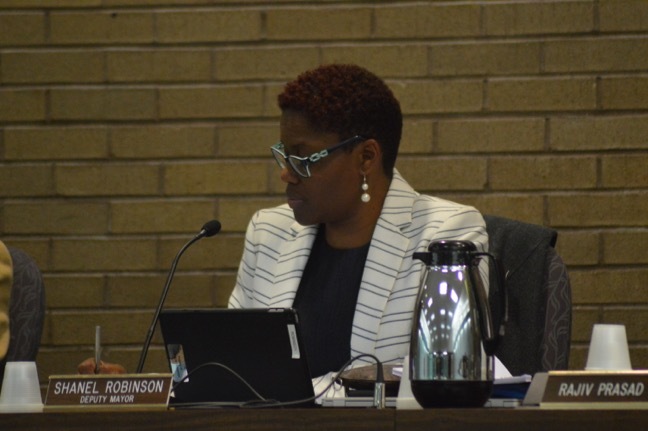 A number of township residents spoke against Prasad’s handling of the process at the council’s Sept. 13 meeting, and Township Councilman Ted Chase (D-Ward 1) suggested that Prasad resign. Robinson said she has no emails on the subject. “Furthermore all emails to and from Franklin Township regarding this subject have been released to the newspaper,” she wrote. Schaffer said county taxpayers want transparency, and suggested several ways to achieve that in county government: Move Freeholder meetings to the evenings and rotate their locations around the county, “come clean” about development deals at the Natirar property in Peapack-Gladstone, Far Hills and Bedminster, and live-stream governmental meetings. In the release, Schaffer compared Gaburo’s calls for Robinson’s emails “eerily similar” to something Pres. Donald Trump said on the campaign trail in 2016. “The only thing missing in that release was a call for Russia to help find them,” she said.